Whether you are looking for a work party, special meal or working lunch, River Cottage is the perfect place for your next event. The famous River Cottage Farmhouse can accommodate up to 18 guests. For larger groups we seat up to 64 in our Barn and more in the summer if you spread out on to the adjoining decking. Private Dining allows exclusive use of your chosen space for the duration of your event. 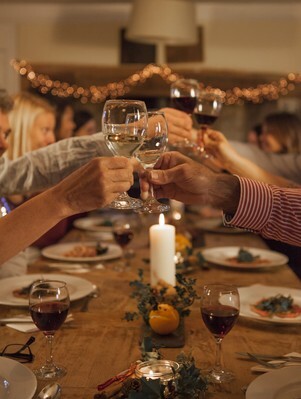 Our dining events usually begin with welcome drinks and canapés, followed by three or four courses of delicious seasonal food prepared by your personal chef, who’ll introduce the menu before leaving you to enjoy the feast. "We had the most wonderful day, and I can’t thank everyone enough for making it so perfect. The food was superb, and I will be recommending private lunches at River Cottage to anyone who will listen,we absolutely loved it!"